Steps in this fellow’s transformation. 1. Paint watercolor paper with a variety of washes of acrylic paint. Whatever is leftover on the palette is a good place to start. 2. Sketch some fun cartoony fish. Don’t forget the teeth and the eyes and a few fins. Shape can be as creative as you like. 3. Fill in bodies, leave the eyes and teeth unpainted, with a color of your choosing. 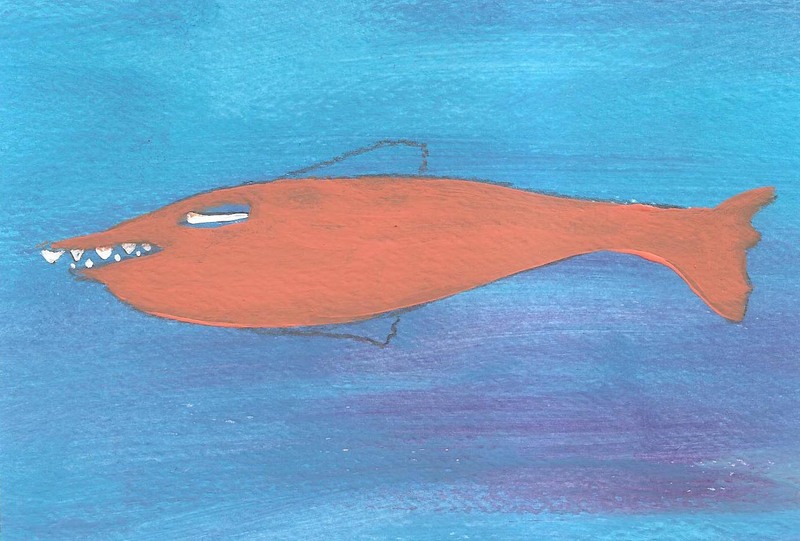 I love the blue background and orange fish contrast. 4. When paint is dry, acrylic is pretty quick, 5 minutes on watercolor paper, paint white teeth and whites of eyes. 5. Begin to add patterns, white really stands out. Drawing the fish and putting in detail is what I enjoy. Hint: these little details can hide mistakes. Use a tiny liner brush for control. Add water or acrylic medium to your paint to get the viscosity you can manage. There you have it. A step by step to the creation of a fun painting for all ages. Coming up soon: I will add one more step when I mount these fellows for display. It took a family effort. I am now having fun getting ready for the approaching Spring for Handmade Art sale at Artistree Co-op on March 27. 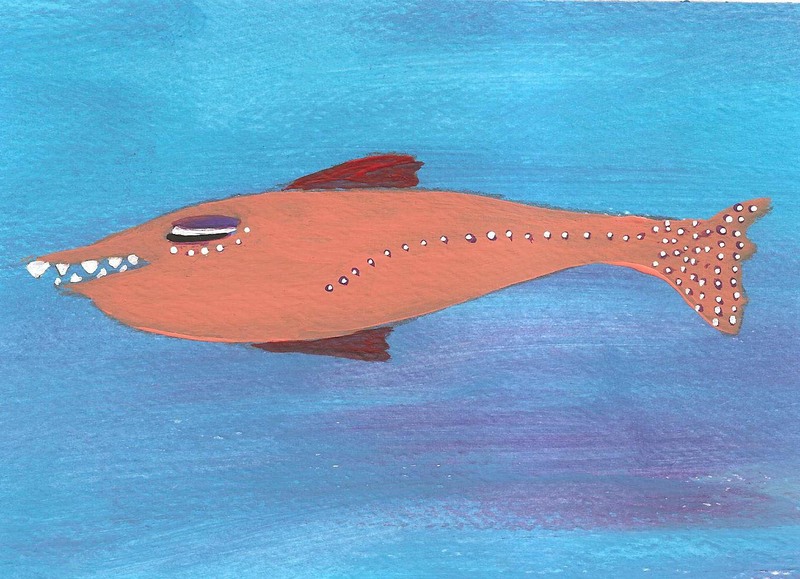 This fishy character is one of several in the process of becoming a niftyartgirl original. I was in a slump as far as creating some new images. My son was home for a few days. Yesterday he spent the afternoon working on a wooden sign for his fraternity in my studio. Having his energy and peaceful nature in the room with me was a catalyst to creating again. The sense of humor my family has shared for generations woke up again. Look for this new cast of characters and their pithy sayings at this fun outdoor event in College Park. I will post several on etsy in a few weeks also.